Heirloom carrot developed in 1886. Market gardeners in Danvers, Massachusetts, developed this variety and shared it with Burpee in 1886. The root is a rich, dark orange and is 6-8" long. A first-class carrot for all soils. Fruit Size The average size of the fruit produced by this product. Growing carrots in containers is easy in early spring and again in the fall. Sweet crunchy carrots are a home-grown favorite of adults and children alike. Carrots can be sown early, after danger of heavy frost is over. Sow every two weeks thereafter for continuous harvest, or simply sow a second crop in midsummer for fall harvest. In frost free areas, sow in fall. Carrots do not like to be transplanted and are best sown directly into the garden bed. 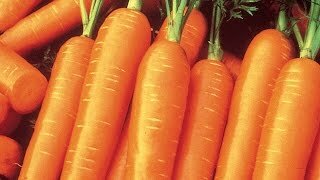 Sow carrot seeds in deep, well-worked soil in full sun. 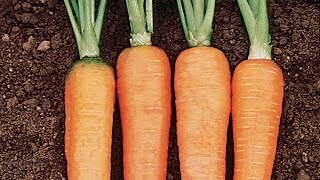 Straight roots require soil that is light, loosened deeply, and free of stones, so prepare a carrot planting thoroughly. Consider using a soil amendment such as compost if your soil is heavy. If you choose long carrot varieties, your soil will need to be worked more deeply. Sow thinly in rows 12 inches apart and cover with ½ inch of fine soil. Firm lightly and keep evenly moist. Since seedlings have fine leaves it may be beneficial to plant radish along with your carrot seed. The radishes will be harvested well before carrots form and act as a guide to the carrot row. Seedlings emerge in 14-21 days. Thin carrot plants to stand 1 inch apart when seedlings are 3 inches high. Keep weeds under control during the growing season. Weeds compete with plants for water, space and nutrients, so control them by either cultivating often or use a mulch to prevent their seeds from germinating. Deep, consistent watering and soil well-enriched with compost help carrots form high quality roots by encouraging lush leafy tops that shade the roots, helping to prevent "green shoulders." Keep plants well watered during dry periods to promote uninterrupted growth. Plants need about 1 inch of rain per week during the growing season. Use a rain gauge to check to see if you need to add water. It’s best to water with a drip or trickle system that delivers water at low pressure at the soil level. If you water with overhead sprinklers, water early in the day so the foliage has time to dry off before evening, to minimize disease problems. Keep the soil moist but not saturated. To make harvesting easier, soak your carrot bed with water before pulling. Twist the tops off while pulling the roots up. You can leave carrots in the ground after the first frost. In cold climates, pull carrots up before the ground freezes. In warm climates, you can harvest carrots all winter. Cut the greens off the top after harvest to about ¼ - ½ inches above the shoulder. This will help the carrot to keep longer as the greens can take moisture from the root. Carrots store best at 32-38 degrees F at 98% humidity. You can store them in the refrigerator in plastic bags, or they may be blanched and frozen for later use. Carrots may be canned or pickled as well. Carrot, Danvers 126 is rated 4.1 out of 5 by 17. Rated 1 out of 5 by 2AcreLiving from Nothing germinated I bought seeds last year. Not a single seed germinated. I see other reviewers having similar issues or disappointing crops. I followed all instructions. To not waste my seeds I am trying them again this year but will soak my seeds first to see if that works better. I am buying a different type of carrot to see if they work better. Rated 4 out of 5 by Lmali from Amazing taste, frustrating to grow I planted two rounds of these carrots this year, one spring crop and one fall crop. The spring crop was pathetic, barely worth harvesting. My *biggest* carrot from that crop was half an oz and only 3" long. The fall harvest was much better, but still my biggest carrot was only 6" long and 1.5 oz. They took considerably longer than 75 days as well, with both crops taking around 110 days. The flip side, though, is that the taste of these is incredibly. Very complex, with a slightly spicy finish. I'd grow them again for the taste alone, but if you're looking for a short DTM or a show stopping carrot size, look elsewhere. Rated 1 out of 5 by Cashburn from So, just me- This carrot has worked so well for other reviewers, I figured it was a no-brainer! I planted 3 to a hole x 15 holes in my square foot garden. Three months later, I have four healthy sprouts. Starting to think I got a bad bag? Rated 5 out of 5 by Archer from Tasty Carrots I bought these seeds 3 years ago. That year was the first time I've ever tried growing carrots and also was my first year trying a vegetable garden. The seeds germinated as advertised, but took slightly longer to reach harvest size. This was likely due to my error and having soil in the garden that was slightly too compact. It was a newly established garden. That being said, the carrots were THE BEST tasting carrots I've ever had and my wife agrees. I've taken the last two years off planting this variety so I can work on getting some more organic matter into my garden to soften up the soil. Next year I will be attempting to grow a lot of carrots, particularly this variety. Rated 4 out of 5 by Darius from Average results I grew six different types this year (Danvers, little fingers, Kaleidoscope, Scarlet Nantes, Short ’n Sweet, and Sugarsnax) and with these I got average results. I've grown these a couple times in the past and got about the same results. The best carrots I've ever grown were Sugarsnax. Rated 5 out of 5 by lynnski from Elevated Bed Experiment I have grown these before and loved them. This year I experimented with an elevated bed due to aging knees. It turns out that these carrots grow just as well and are easier to harvest in the elevated bed. I think they matured earlier too. Rated 5 out of 5 by jimfromliny from Very tasty, very easy to grow I planted about 100 seeds in April, they grew slower than I thought and were all about 5" or so, but they are very tasty and super crunchy. I made a couple of glasses of carrot and apple juice with these and I felt sad when I got to the bottom of the glass, no more.... Delicious, although they did not reach the 6-8" length.